Probiotics in Your Garden?! YES! Believe it or not, the homemade common green pickle is an excellent probiotics food source. So is homemade sauerkraut, considered a probiotic super food! And the ‘sauerkraut’ can be made of any of the Brassica family plants – broccoli, cabbage – green or red is fine, cauliflower, brussel sprouts, kale, bok choy, kohlrabi, etc. These plants have the same bacteria as in yogurt, and the bacteria does all the work naturally! Probiotics? Say what? What are they and why would you want them?! Pickling cucumbers are fun to grow, crunchy tasty off the vine, and the survivors are easy to make into pickles! Basically, use any mix of spices that pleases you, add it to your jars. 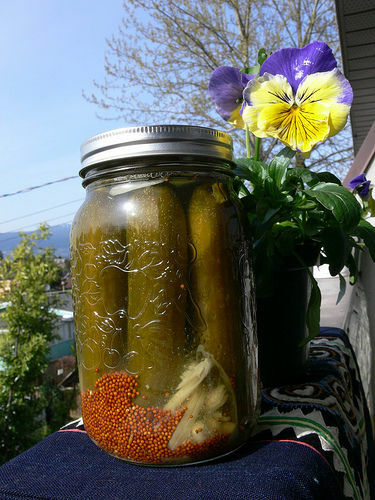 Wash, leave whole or cut to fit, and puncture your cukes – so the brine is better absorbed, stuff them into the jar too. Make a salt and water brine, pour it over them a 1/2″ more than the height of the cukes. Ferment a few days and they’re yours! HellaDelicious uses a marvelous spice mix (below), and has great tips on her page by page recipe – see all the details! Or just do water and salt, forget all the spices! But, I’ll bet you have a few of these spices handy and could quickly throw in a few, just your favorites, of course! Be creative! This works for any veggies you would like to pickle – cauliflower, beans, asparagus, onions, carrot slices, beets, tomatoes! You may enjoy A cheater’s guide to quick pickling almost anything by wild Brooklynite pickler Kenji Magrann-Wells. Enhance the vitamin content of the food. Preserve and sometimes enhance the enzyme content of the food. Improve nutrient bio-availability in the body. Improve the digestibility of the food and even cooked foods that are consumed along with it! To your excellent health and the great sport of pickling and krauting!